ARE YOU EXPERIENCING THE LOYALTY CHALLENGE? The 2016 Deloitte Millennial Survey revealed that 2 in 3 Millennials plan to leave their current company by 2020. Why? The survey found that employees feel underutilized and believe they are not being developed as leaders. Here is an opportunity to give them what they want: the TOOLS & SKILLS to do their best work and become authentically powerful leaders that drive business success by fostering high-performing teams. The next class is launching soon. Contact us now for pricing and registration. 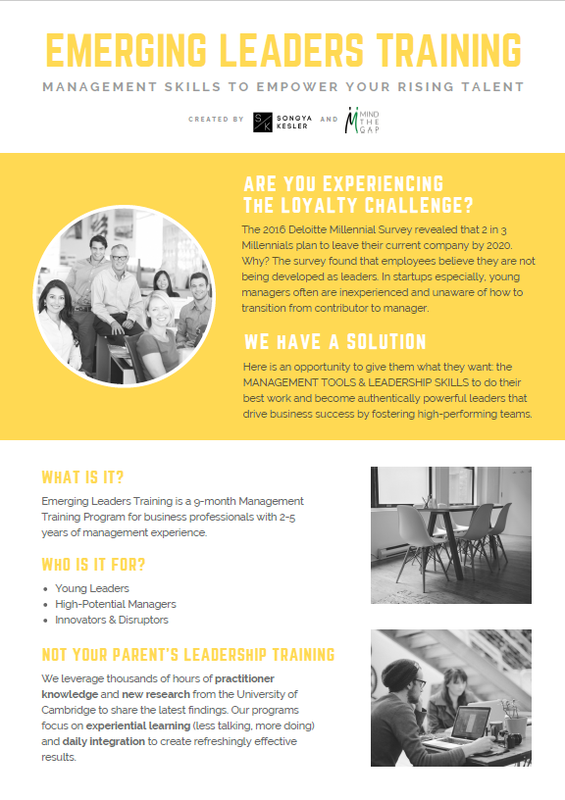 Emerging Leaders Training is a 9-month Leadership and Management Program for business professionals that strive to excel in their personal & professional lives. It is co-designed by Songya Kesler and Mind the Gap. We leverage thousands of hours of practitioner knowledge and new research from the University of Cambridge to share the latest findings in leadership and management. Our programs focus on experiential learning (less talking, more doing) and daily integration to create refreshingly effective results. Participants should have a corporate sponsor who believes in them and wishes for nothing less than their absolute success. This program is part of Songya's offerings for businesses. Learn more about what my colleagues and I can do for your business and leadership needs by clicking below.